Experience the ease of working with Soft and Stable and the professional finish that it gives a project as you make this quick and easy notebook cover. The cover protects a standard side-bound 3” x 5” notebook and has an interior pocket to hold business or credit cards. 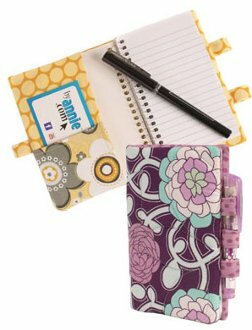 Pen tabs add a decorative touch, provide a smart way to close the notebook, and keep a small pen always at hand. Quick, easy, and great for gifts!